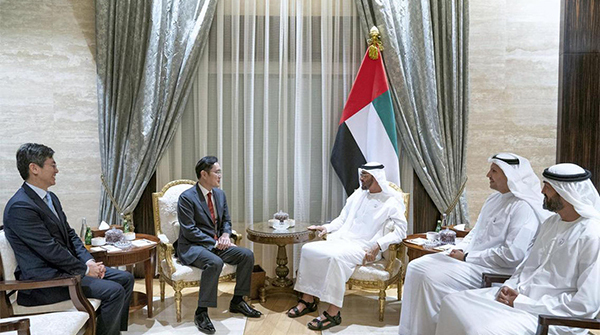 Jay Y. Lee, vice chairman of Samsung Electronics Co., met with Crown Prince of Abu Dhabi H.H Sheikh Mohammed bin Zayed bin Sultan Al-Nahyan in the United Arab Emirates and discussed areas of cooperation in 5G wireless and other technologies. The meeting was made public through a photo posted on the U.A.E crown prince’s Twitter account. Local media reported Lee met with the crown prince on Monday during his visit to the country to attend the World Government Summit 2019. Samsung confirmed the meeting, but denied Lee attended the global summit. The World Government Summit is an annual event held in Dubai where top government officials and private sector leaders discuss future trends and issues. This year’s event was held on Feb 10-12 and speakers included International Monetary Fund`s Managing Director and Chairwoman Christine Lagarde and Secretary General of the OECD (Organisation for Economic Co-operation and Development) Jose Angel Gurria. The U.A.E media reported that Lee and H.H Sheikh Mohammed bin Zayed explored prospects of cooperation in IT sector, especially 5G network and future technologies. In March last year, South Korean President Moon Jae-in made a state visit to the Middle Eastern country. The president and H.H Sheikh Mohammed bin Zayed agreed on upgrading bilateral relations to a special strategic partnership, strengthening cooperation in science and technology sector.